This is the original Pete Cornish Treble Boost designed and built by him from the early 1970s and still in production. This is the original version supplied to Brian May and can be heard on all Queen recordings. Pete is still using the same artwork for the circuit board and identical components are sourced from the original suppliers. Each pedal is individually hand made by Pete and Lynda Cornish from the etching of the circuit board through to the testing of the finished unit. No other person is involved in the production. 1. 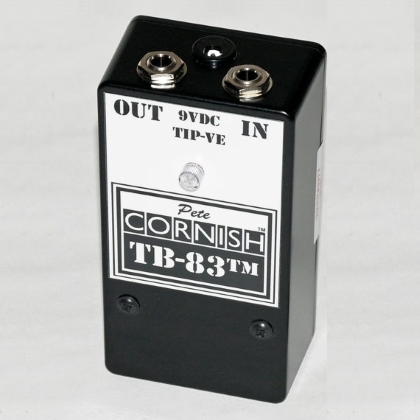 The TB-83™ was originally designed to be the interface between Burns Tri-Sonic pickups and the “Normal” input on vintage (pre Treble Boost) Vox AC30 amplifiers. 2. Each TB-83 is individually numbered, signed and dated internally which provides full traceability and history. 3. Due to the modular design of the TB-83™ all parts are replaceable if they become damaged. Please contact us if you wish to purchase replacement parts. 4. The active circuitry is potted in semi-flexible resin as vital protection: a) against environmental conditions which can cause unwanted changes to the electronic circuitry and b) to eliminate the possibility of microphonic feedback that can occur when high gain devices are used in close proximity to amplifiers at full volume. Glass fibre PCBs are prone to resonant vibrations and our use of dense potting material increases the mass of the circuit board to place any possible resonances outside the audio frequency spectrum. 5. The maximum output of the TB-83™ is +10dBm and the measured output noise with a 10Kohms source impedance is -82dBm giving a signal to noise ratio of 92dB. 6. Battery life: current consumption is low (approximately 540μA) and the supplied Duracell “Procell” MN1604 should last up to 500 hours before noticeable loss of signal occurs. When it is apparent that the battery requires replacement remove the four Pozidrive #2 screws from the base plate, unclip the battery (noting carefully how the battery is located in the case) and fit the new one. Take care not to trap the battery wires under the base plate when it is reinstalled. 7. Supplied free with each TB-83™ is an old (now obsolete) English Sixpence piece. This coin is the type used by Brian May as a guitar plectrum. This is the second Pete Cornish Treble Boost designed and built by him from the early 1970s and still in production. It is one of the original versions supplied to Brian May and can be heard on Queen recordings. Pete is still using the same artwork for the circuit board and identical components are sourced from the original suppliers. Each pedal is individually hand made by Pete and Lynda Cornish from the etching of the circuit board through to the testing of the finished unit. No other person is involved in the production. 1. Guitar into TB-83™ in; TB-83™ out to TB-83 EXTRA™ in; TB-83 EXTRA™ out to amp in. TB-83 EXTRA™ volume control may be used to match the level when the TB-83 EXTRA™ is engaged and the additional treble boost will allow you to “cut through” the mix. 2. Guitar into TB-83 EXTRA™ in; TB-83 EXTRA™ out to TB-83™ in; TB-83™ out to amp in. The TB-83 EXTRA™ volume control now has a completely different function: it allows complete control over the “drive” into the TB-83™ input with a huge range of different sustain and harmonically rich distortion products. The overall volume, however, will remain virtually constant but the new singing tone will delight and excite you. The TB-83 Extra Duplex™ combines two of our TB-83 Extras™ in one pedal to give you flexibility and different tonal colors to play with. Set each one to different volumes to give two different degrees of boost and then combine them to obtain up to double the gain of each individual effect. Also can be configured as the TB-83™/TB-83™ Extra combo noted above.